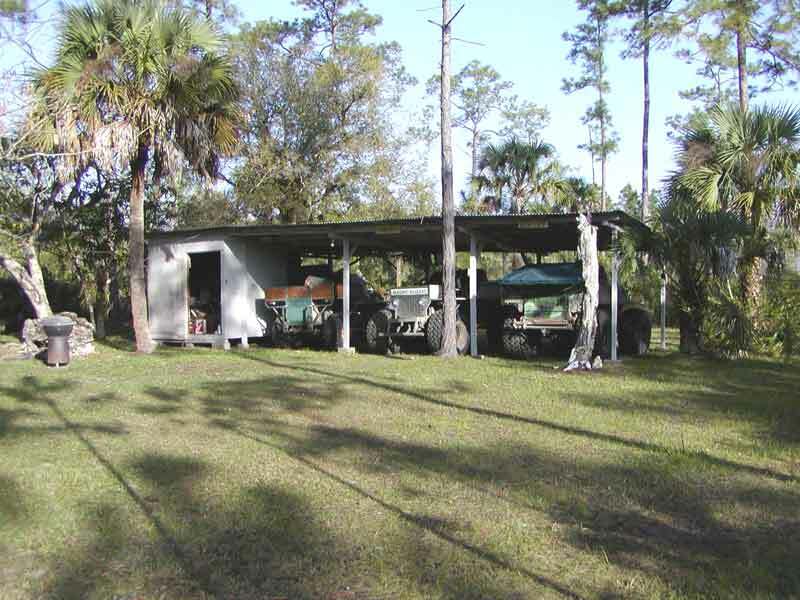 Camp "Six Pack" is located in the middle of the "Big Cypress National Preserve". It is about as far from a paved road as you can get in Florida. It is eleven miles north of US 41, (the Tamiami Trail) and about 10 miles south of Interstate 75, (the Alligator alley). East and west, it about the same distance from the Atlantic Ocean, as it is to the Gulf of Mexico, hey! that's right in the middle. The mileage is "as the Crow flies", no one knows for sure how much ground is actually traveled around all the swamps, cypress heads, palmettos and alligators. Odometers are not accurate because the tires go further then the vehicles, because of slippage in the mud. A trips progress is best measured by land marks and time. A good trip takes about three hours from the paved road to camp. This is usually only possible during Spring time of the year, when the normal water table is below ground level in most places. The rest of the year the water table is above ground, any where from inches to more than 24 inches deep. This slows a trips progress considerably. Some trips have taken six, even eight hours. This is a long time to be out providing a meal to swamp misquitos and other things that like to nibble on people. Is the trip worth it? Yes! Yes! Yes! The name of the camp probably brought up a vision of Beer guzzling, redneck hunters, with their favorite past time being drinking beer. Actually the name originates from the six owners. We are a pack of guys, six in number, that have the same interest, a love of nature, hunting and the outdoors. 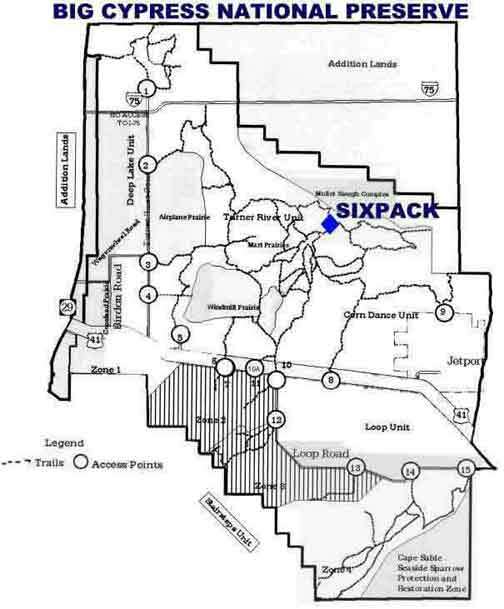 Although we don't march to the same drummer, (some of us like beer and some don't) and we have different levels of interest in camp "Six Pack". We have all enjoyed the camaraderie of the adventures in getting to camp, hunting, meals and evenings around the fireplace. Each and everyone of us, including our guests, has stories to tell and fond memories of "going to camp". 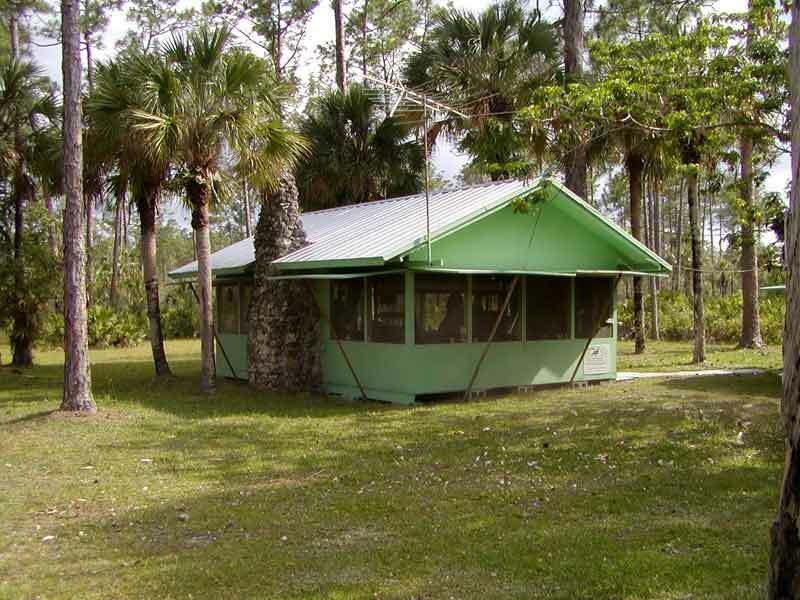 The Camp itself consists of three plywood buildings, on three acres of private land, surrounded by 52 square miles of "Big Cypress Preserve". Most of the three acres is a pine island, covered with southern pine trees and palmetto bushes, an island eight months of the year, when the water table is up above ground. The three buildings consist of a sleeping cabin, a kitchen/dining/ bathroom building and a storage building. The buildings have been rebuilt and enlarged, the original building, was destroyed in a forest fire, in the early years. The sleeping building is about 24 feet by 16 feet, configured as one large room and will sleep about eight to ten people. The kitchen is about 16 feet, by 16 feet, including a 4 foot by 8 foot bathroom. This makes for cozy meals, when the cook and eight people want to eat. 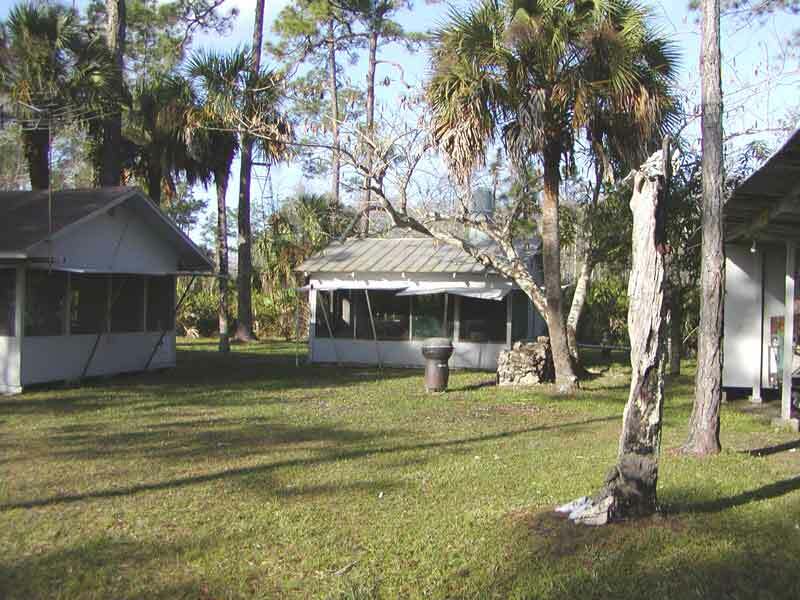 The Camp was constructed prior to the creation of the "Big Cypress National Preserve", in 1974. For this reason the Camp was exempted from purchase by the Federal Government, as the Preserve was being formed. There are about one hundred private, exempt properties within the preserve. These one hundred properties are owned by the true lovers of the "Big Cypress". Access to Camp "Six Pack" is by Off Road Vehicle, the name given to "Swamp Buggies" by the Federal Government. 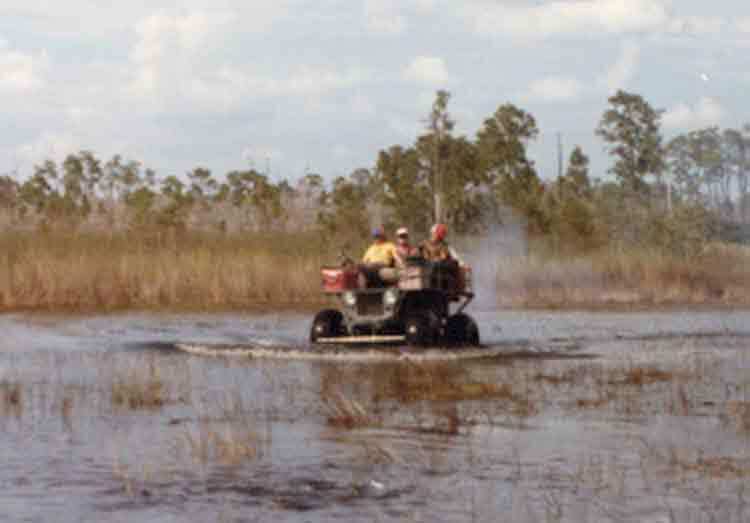 Only vehicles registered by the "Federal" people are allowed to venture into the Big Cypress Swamp. The "Federal" people of course, feel the need to regulate just about everything. So, the vehicles are regulated, they must be weighed, inspected, pictures taken and meet certain requirements. One of which is they must have 9 inch wide tires, as though anyone would get very far into a swamp with narrower tires! Now the "Federal" have restricted us to designated trails, this is a big change from the "Traditional Use" of the Big Cypress Swamp. ORV use is a big concern of the "Federal" people, and in their wisdom, have authorized a study to be done, by Virginia Tech. and Utah State University? I'll bet they know a lot about swamps. Mountains and Deserts are so closely related! They have got to spend Your U.S. tax dollars on something, you know! This page last updated on Aug 11, 2001.